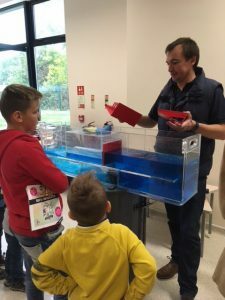 A team from JBA Consulting attended the event, demonstrating the large and mini hydraulic flumes as well as exhibiting the point cloud technology (an interactive model of an asset captured in time) being used by JBA-Bentley. If you would like further information about the JBA Trust physical models or to discuss how these models might support your education or engagement event, please get in touch. « Can the past be a reliable guide to the future?